The Novo DS is a powerful, yet easy-to-use, digital signage solution that works equally well in small and large scale deployment situations. 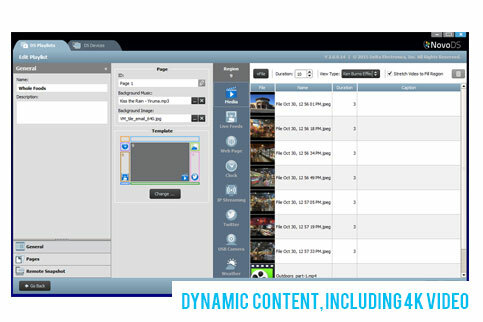 With a well-thought-out user interface, editing digital signage templates and creating playlists has never been simpler. In just a few minutes with the intuitive DS software, you'll be able setup dynamic signage views that include images, video up to 4K, twitter feeds, webpages, IP camera footage and more. All without the need of a programmer or designer. The Novo DS can be used as a single signage solution or in a large-scale deployment environment, with network-based remote management and maintenance software included. Simply choose the tab labeled DS Devices within the software and a new device, assign it to a group (e.g. a building or area within a building), assign the desired playlist and setup playlist schedules if necessary. 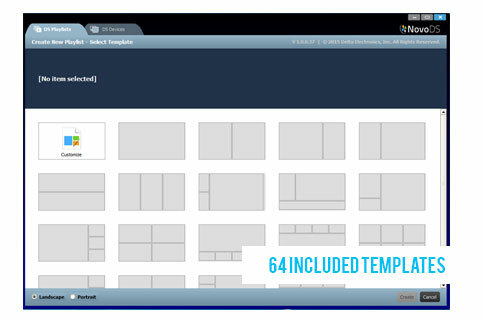 You can even preview the screen of each networked device from within a central interface and manage it remotely. 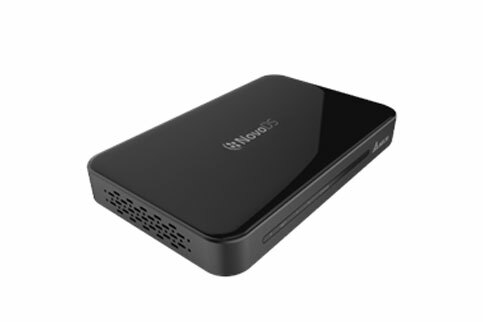 With the Novo DS, there are no annual or monthly subscription fees to worry about, and in most cases, no complex network setups that require IT assistance. Each device includes a mounting bracket, USB power adapter and power cable, along with an HDMI cable and remote control . The 5GB of available internal storage are enough to get you up and running, but it also includes a MicroSD card slot to expand the device storage to a substantial 32GB. Full HD 1080p, 60fps display quality with support for the next generation of ultra-high resolution (3840 x 2160) displays from the USB or microSD slot. Manage and monitor the status of content playing to a single display, group to Enterprise wide with real time updating. Multi-playlist scheduling and Remote Snapshot of content playing per NovoDS. We have no downloads available for the Vivitek Novo DS at this time.